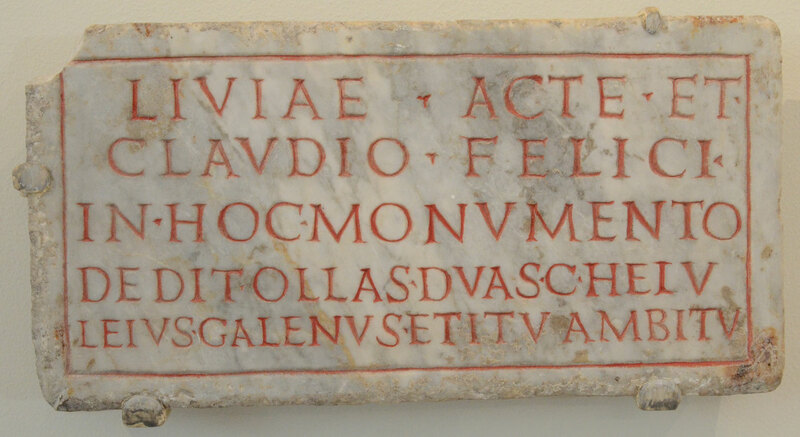 This inscription marked the burial monument of two people, a woman named Livia Acte, and a man named Claudius Felix. A man named Gaius Heiuleius Galenus placed their urns in the tomb, but we do not learn his relationship to the deceased. The last two words are a common phrase in Latin tomb inscriptions and intend to keep passers-by from entering the tomb and its surrounding area. The inscription was found in Rome and is dated to the first century CE. H.L. Wilson, “Latin Inscriptions at the Johns Hopkins University III,” American Journal of Philology 30 (1909), 153-170, 157-8.